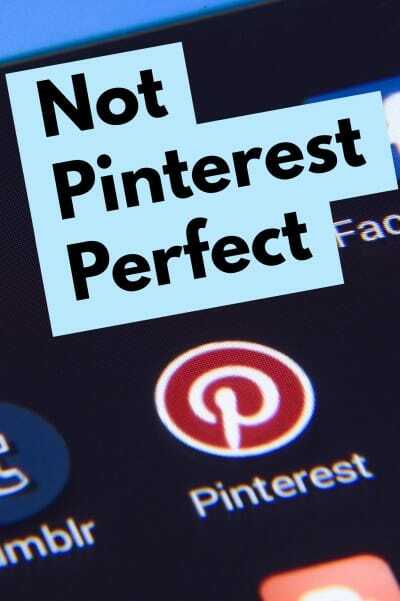 I have a confession to make, I am not “Pinterest Perfect”. As a professional organizer, my home is well organized and decluttered, but my family LIVES in it. It does not look like a magazine or a Pinterest photo, it looks like a HOME. In my experience, the only time a home looks Pinterest perfect is when it is staged, and most likely no one is living there. So many times we’re influenced by social media, to the point where if we don’t have picture perfect everything we feel like a failure. I’ve encountered many organizing clients who apologize or feel embarrassed because their home doesn’t look like a showroom. Striving for standards of perceived perfection like this can only result in distress. Pinterest offers a beautiful array of photos and many DIY home organizing and decorating ideas. Remember, these are only ideas or examples created by artists, designers and the like. Yes, you can make your home look beautiful, but the act of living it in “messes things up.” Every home has mail and groceries coming in and out, dirty dishes, dirty laundry, and STUFF. This is stuff you don’t see on Pinterest, this stuff is the product of everyday life, and it is a reality for everyone. You can organize so that regularly used stuff has a place in your home, but that inflow and outflow of things will continue throughout your life. Do not compare your home to what you see on Pinterest, in magazines or media. Remember, these photos and videos are staged to look their best, similar to how an airbrushed supermodel image is created. Instead of trying to reach impossible standards, focus on creating a space that is functional for you, where you can find things when you need them. Strive to create a home that helps you manage things and feel calm, rather than try for some ideal of perfection that brings you stress. If you need assistance in creating a decluttered, organized and functional space that is based on your real-life and attainable to you, please contact me for a brief video chat or phone call to discuss your organizing needs. I offer hands-on help in the Raleigh, North Carolina area and virtual organizing services outside my travel radius.